I come back over and over again in to old themes in my Arts and Science projects. This time it is medieval city of Tournai. Tournai was one of the tapestry weaving centres at the time. I have visited and stayed overnight in there. 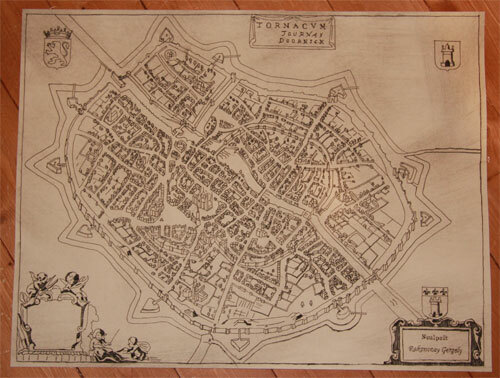 My very first copper printing plate is town map of Tournai. Now I have reached Tournai from an other point of view. It is again a map, but made by computer game Forge of Empires. There was, ofcourse, some problems with a scale of the buildings and roads. 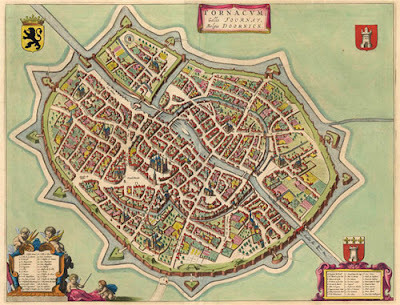 This is the original map. Now I will quit playing that game. It has some features I do not like. And next I will move more and more further in timeline.